Johnson and his car won the pole for Saturday’s Sprint All-Star race. Seeing Johnson and his car out front at the team’s home track is nothing new. He has five wins and two poles in points-paying races at Lowe’s and two All-Star wins, but Friday’s pole is his first in the non-points all-star event. Johnson and his crew chief Chad Knaus won’t get to pick their pit stall, as the pole winners usually do at Sprint Cup races. For this event, the winner of the pit crew competition on Thursday – Jeff Burton’s team – gets the best spot. But Knaus said that’s not a big issue, since the field is smaller than for most races, and there will be plenty of open spots, which will give every driver a clean shot in an out of his pit stall. 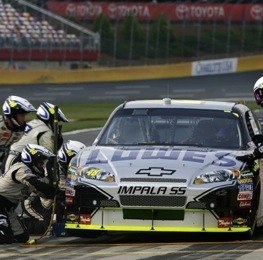 “Everybody has an opening,” Knaus said. Johnson said the key to winning the race is to be in the front two rows for the final 10-lap dash to the checkered flag. “That’s unless the guys up front race too hard and get together,” he said. Second-starting Kurt Busch said he and his crew focused on making a mistake-free run in an effort to avoid being penalized. Qualifying for the all-star race includes a pit stop. “It was a nice, solid run,” he said, that the philosophy his team adopted took the pressure off crew members, who otherwise might rush themselves into a mistake. Busch said he’s got the best starting spot in one respect because his car handles better in the outside groove. Still, he pointed out, he can’t jump the pole-sitter, according to NASCAR’s rules. Matt Kenseth qualified third, which combined with his pole-winning performance at Darlington last week, gives the normally poor qualifier two straight starts from the front. Dale Earnhardt Jr. starts fourth ahead of Mark Martin. Rain washed out qualifying for the Sprint Showdown, so the field was set according to the random qualifying draw. Unfortunately for the two drivers who drew the front row, they’ll be starting from the back. Kirk Shelmerdine wrecked his primary car and Carl Long’s team changed an engine, moving David Stremme and Dave Blaney to the front row .